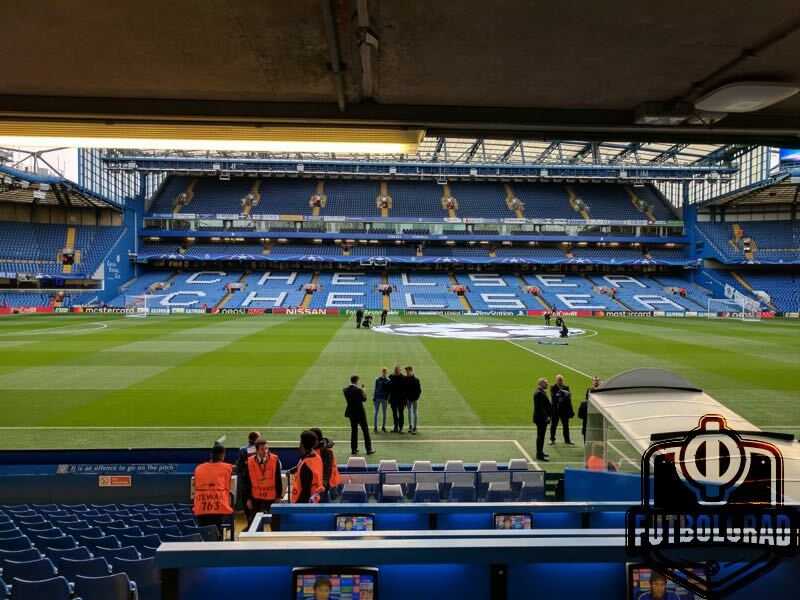 Welcome to our Champions League Chelsea v Qarabag Minute by Minute report. Qarabag are the first Azeri side to have qualified for the group stage of the UEFA Champions League. Drawn in a group with tonight’s opponent Chelsea, Roma and Atlético Madrid Qarabag are unlikely to advance from Group C. At the same time, Qarabag will be fully supported by the entire country as the club embarks on its biggest ever adventure. The hosts were clinical, professional and showed all their European experience. The side from Azerbaijan have been whipped here in West London, it’s all a learning curve for them but it’s been an exceptionally steep one. The fourth official holds up the board, we’ll have three more minutes. Ndlovu with a glorious chance to register a goal for the visitors. He receives the ball on the left side of the Chelsea box, skips past his man into space but can only fire the ball over the bar. He should really have tested Courtois. Qarabag must be wishing the last five minutes away. They’ve been battered here, Chelsea have been clinical and dominant from the first whistle. GOAL: Chelsea 6:0 — Michy Batshuayi gets his second of the night. Another defensive error and Qarabag are punished again! There’s 10 minutes left, Chelsea’s class is showing in droves. Two Mr Conte? It’s five and it could be more with plenty of time left for another..! GOAL: 5:0 — Batshuayi curls the ball home from 18 yards, beating Šehić on his near post. The final whistle can’t come soon enough for the Horsemen. Just before the goal we had a Stamford Bridge WiFi outage.! Qarabag made a double substitution — Madatov for Sadygov and Diniyev for Garayev. GOAL: Chelsea 4:0 – Bakayoko scores his first Chelsea goal, a half volley from the edge of the six yard box. It is turning into a long night for the side from Azerbaijan. Willian picks the ball up 25 yards from goal and drives into the Qarabag area, he unleashes a shot from just inside the 18 yard box and it beats Šehić but cannons off the crossbar. Unlucky ! Chelsea’s attack is now relentless. Šehić looks a man under constant pressure. Chelsea substitution. OFF Pedro > ON Hazard.. He’s on now guys.! GOAL: Chelsea 3:0 — Azpilicueta heads home a floated ball by Willian from the free kick. Hüseynov challenge is a costly one. Willian is sent flying by Hüseynov, it’s a ridiculous challenge resulting in a dangerous free kick chance. Qarabag have their first direct shot of the night. South African striker Ndlovu tries his luck from 25 yards, Courtois saves easily. With the hosts 2:0 up the tempo has slowed right down. Qarabag look to retain possession anytime they can get a sniff. Chelsea have dropped right back out of possession, inviting their guests on. Chelsea get the second half underway. Can they add to their 2:0 advantage? Alonso with a good chance on the edge of the six yard box but he can’t find a way past the Qarabag last ditch block. It’s the final chance of the half, the referee blows his whistle. Some excellent interplay from Chelsea finds Alonso free on the right side but he fires a cross into the top tier behind the goal. Qarabag are trying to attack but the shape held by Kanté and his fellow Chelsea midfielders is exceptional. They are forcing the Azerbaijanis backwards to try and find a way past. Conte looks a happy manager on the sideline, lots of thumbs up signals to his players. Henrique AGAIN can’t feed the ball through to Ndlovu who is in space. The Brazilian has now wasted two good opportunities to feed the Qarabag attacker. Míchel finds space on the left and attacks towards the Chelsea goal. The Qarabag midfielder hesitates, allowing the Chelsea defence to regroup and challenge for the ball on the edge of the area. Danger averted for the leaders. Just over 10 minutes until half time and it’s been very easy for Chelsea so far. Qarabag are just lacking a little quality to really test their English hosts. Two brilliant strikes separate the sides. GOAL: Chelsea 2:0 Zappacosta with a ripsnorter from 25 yards out. What a way to introduce himself to the Stamford Bridge faithful on his debut. Chelsea have had the majority of possession and chances so far. Pedro’s six minute opener still separates the sides. Zappacosta floats a header goalward but Šehić saves well, the Assistant on the far side raises his flag, it wouldn’t have counted if it had found the net. Willian goes close after finding some space to shoot. Šehić saves well and Batshuayi can only smash the follow up into the side netting. Cahill picks up the first yellow of the night after a hard tackle on Henrique. Qarabag have a dangerous free kick on the left hand side of the area after Alonso makes a rash challenge. Guerrier drives the ball at goal but it flies over. Henrique looks to feed the ball through to Ndlovu but he can’t find the right weight on the pass. Had he judged it better, the South African was one-on-one with Courtois. The visitors from Azerbaijan have started to settle after being rocked by an early goal. They are however, forcing the ball forwards at times. Willian goes clean through and squares the ball but it flashes across the box. Qarabag could be in for a long night. GOAL: Chelsea 1:0 – Pedro with a right footed curler from the edge of the box. What a start by the English champions. Qarabag have the first attack, Henrique breaks down the right but the ball just runs out of play. The rain has started to lash down here in West London, it could make the surface slippy.! Chelsea have identified a few Qarabag threats on their Twitter feed. Just under 30 minutes until kick off. Manuel Veth’s pick of the players in the preview was Álvaro Morata for Chelsea, who starts on the bench. Meanwhile, Qarabag’s South African striker, Dino Ndlovu, has a start for the side from Azerbaijan. Kick off is 60 minutes away, we’re expecting the team news any moment.